Today I followed Buaya Wing to KLCC coz she had to attend her KLCC Fashionista Mac Workshop at 7pm. We left One Utama roughly 6.15pm took the shortcut "penchala link" paid rm2 for toll charges and zoomed our way to KL City. While she was there, I decided to visit the Chanel Roadshow which is just outside of Mac Cosmetics boutique. Lots of people there! lThe previous Isetan newsletter allows IMC/ICC members to redeem a free Chanel Chance 2ml perfume vial limited for the first 100 only while the latest newsletter allows the first 50? or 100 (can't remember) to redeem a Chanel Coco rouge sampler during the Chanel Roadshow from 21-27 April. 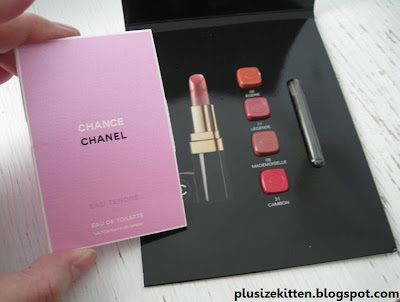 The Chanel Coco Rouge sampler is a cardboard sampling card with 4 circles of lipshades on it. At the side is a mini lip brush so you can use it on the circles for application. The Chanel Chance perfume smells really nice! but it's also pricey! 50ml for rm222 and 100ml for rm332. Chanel Coco Rouge lipstick is going for RM95 and with the roadshow promotion, you get a limited edition badge, a lip makeover, and Chanel surprises (as stated on the promotional postcard at the venue). I bought one as a mother's day gift but I was not offered any lip makeover (nvm, don't need it). The Chanel badge has various design to choose from but the limited edition designs (with lip kiss prints) are going off fast. As a Isetan member, you also get double points for your Chanel purchases during this time. I suggest buying something else so u can get free 2 hour carpark from Isetan. *will try to show pictures tomorrow! sleepy now. The gift wrapping for lipsticks so nice!!! ^_^ and all of the guy make up artists also very leng chai oh. Fatin: oh dam i just remember Anna got blog about the print out email poster so can try lip makeover n a lipstick sampler too. Nowadays I don't really redeem samples anymore =_= no energy remember things sigh. how come u can get a lip makeover man.. i bought n still wasn't offer one.. but then again, i din know i could get it until read the brochure. ciawei: not bad lah, i do like the ribbon (coz chanel words on it). I din see any guy make up artists T_T dang missed it! The makeover was not only lip though they noted there was lip makeover..the makeup artist help me did a full makeover..
Jean: oh then u gotta print out from AnnaYjia's blog the poster to redeem free lip makeover & sample. Today i got mine again. Rane: u requested for ribbon wrap too? hey u got ask for the edt vial or not? coz today i went n buy again, n requested for it under their chanel surprises. The Sa give me. Joey: it's okay but i saw that they give a special black mini chanel coco rouge tiny paper bag (enough to put lipstick only) that's so cute but they refused to give to paying customers. It's only for those pre-order b4 launch customers. Nian Tse: ok lah the ribbon a lot chanel words. Feel my mom should have something special and "chanel" this mother's day. Pinky: u redeem liao? free lip sampler? susanchu: yeah today i brough a print out poster to go redeem the lipmakeover, niceeee.... i like the hydratin powder :D brightens up my face but rm280 @_@ for it... wuwuuw.... i din see any guy makeup artist T_T missed it.. twice again shheesh.. So many freebies, love the Chanel Chance freebie. I wish to have one.